The first album to be released on CD was Billy Joel’s 52nd Street on October 1, 1982 in Japan, alongside Sony’s CD player CDP-101. 50 CDs were released on this day, with Joel’s nominally number 1, from the the first commercial compact disc pressing plant in Shizuoka Prefecture, Japan – owned by Sony, opened in April 1982. Earlier in the Summer of ’82, the first test CD was pressed in Langenhagen near Hannover (West Germany), by the Polydor Pressing Operations plant. The disc contained a recording of Richard Strauss’s Eine Alpensinfonie (in English, An Alpine Symphony), played by the Berlin Philharmonic and conducted by Herbert von Karajan. In August 1982 the real pressing was ready to begin in the new factory. The first CD to be manufactured at the new factory was The Visitors (1981) by ABBA (DDD in SPARS code); a first public demonstration of the new discs was on the BBC television program Tomorrow’s World using The Bee Gees’ album Living Eyes. Early the following year, on 2nd March 1983, CD players and discs (16 titles from CBS Records) were released in the United States and other markets. 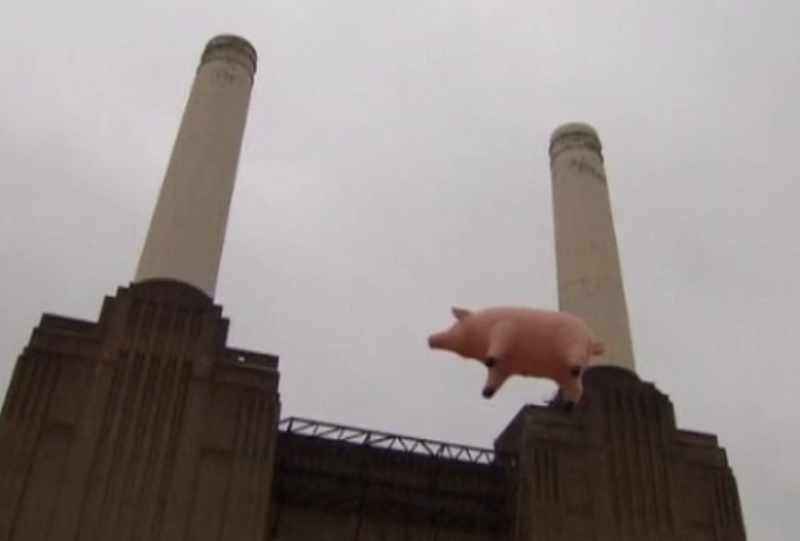 It was a perfectly grey blotched sky, as per the superimposed album cover, with little breeze at ground level but there was the 30 foot Pig battling winds high up. Held down by, and tethered to, 2 cars it was visited early by the Press (but taken down at 10:40 as it was getting just too much for the ground staff to handle). I was informed by the guys working there that there was no marksman on site, so if it took off then that would be it. Hence they were very careful with it. When the wind dropped it was back up. I happened to be listening to Show #171 – Animals in France, from 22Feb77 – courtesy of The Doc at the time. Perfect. 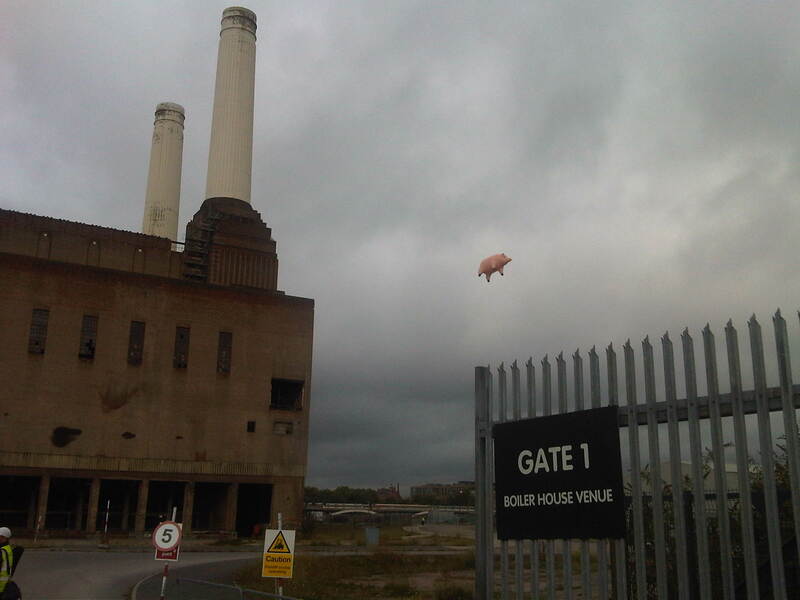 London airspace reported to be safe. For now. Fresh from a recording session for Meddle, Pink Floyd leave the UK on their way to Japan, via Hong Kong, on 31 July 1971. PF took Atom Heart Mother, and an increasingly polished performance of Echoes, to 3 nights in Japan. Their first trip to the country that would embrace the Floyd in a special way – with obis and booklets not released in other countries, and with the release of their first material on CD, that being some 11 years later. Japan was followed by the first group trip to Australia, for 2 shows, before returning to the UK on 19th August 1971. The Dark Side Of The Moon has officially spent 1000 weeks on the Billboard charts, as of this week 11th June 2011 – http://www.billboard.com/#/album/pink-floyd/the-the-dark-side-of-the-moon/61357, which currently shows “-,1000,1” for “placing last week, weeks on charts, highest position(US)” respectively. Go there after this week and expect the 1000 to still be climbing. It’s there, it’s done it. More than any other album by quite some distance. It re-entered the Billboard Catalog Album chart at number 47, reaching in the process the very special milestone of 1000 weeks on Billboard’s charts. It provides us with a strap line to our campaign to take “Dark Side from 1000 (weeks) to #1” in the UK (finally) – The Dark Side Of The Moon, with all its popularity, all its longevity, all its Britishness, still hasn’t been #1 in the UK up to this date – but we mean to change that. Got me wondering though, as it was 1,500 weeks in the charts a few years ago, and has been flagged as over 2250 weeks on Billboard: another stat on another page. It’s great to rejoice, but I’m not convinced by the metrics, and the way sales are logged to charts – different charts, changes over the years, and more recently complications over digital sales. I’ve emailed Billboard to ask them for the official version, but as yet no response – I’ll post it if/when I get it. Plus, there didn’t seem to be any official news release by Billboard with the story, it’s been left to Floyd sites and keen observers. The O2 is a great venue, and with the whole of the stage end covered by The Wall and with the sound effects from each corner, the place was set for a magnificent show. We’d seen Polly Samson’s Tweet the night before, but hadn’t seen the Gilmour blog earlier in the evening saying “Yes, it’s tonight”. And wow, what a night. The show was stunning, great sound, incredible visuals. Roger’s show a masterpiece, carefully crafted quality producing an amazing show. And to witness Dave’s (unannounced by Roger) appearance on top of The Wall for Comfortably Numb, well… you listen to the crowd’s reaction when they recognise Gilmour. Even Roger is smiling. Note 5: And with Nick Mason on stage for Outside The Wall at the end of the show (see Roger’s Facebook page again for footage), an unforgettable gig. Up to this point I’ve said Radio KAOS was my favourite live show. I think it just got beat. Thank you Roger. Thank you David. Thank you band. On the 1st of May 1971, Pink Floyd visited the Abbey Road studios to record parts for the Meddle album. They were under pressure from EMI to release a new record; indeed EMI released Relics later in the month (14th May) to help fill the gap of new material. Starting in early January, Pink Floyd made 14 separate 1971 visits to recording studios in creating Meddle. On Saturday 1st May ’71 they made their 7th visit to Abbey Road that year. The band had recently returned from a European tour of Atom Heart Mother, and were back in the UK for a string of university gigs, before another planned European tour again in the summer. The last song that night, the debut of ‘The Return Of The Son Of Nothing’, was later entitled Echoes after the main recording was finished, and in time for the Japanese tour in August ’71 (the band’s first tour to Japan, a place they would return to on many occasions and owe the earliest Pink Floyd CDs to, and followed by 2 dates in Australia). Echoes was the main event of Meddle, being the whole second half. Meddle was Floyd’s 5th studio album, released on 13th November 1971, but it lacked a central concept. All four members of the band contributed ideas, which were pieced together in a fragmented manner to create the longer atmospheric piece wanted: these small pieces started with ‘Nothing Part 1’, and ‘Nothing Part 2’, then ‘The Son Of Nothing’, and altogether parts 1-24 became ‘The Return Of The Son Of Nothing’. Meddle was later described as the Floyd’s “first good record” by Nick Mason, and “Half good” by Roger Waters, referring to Echoes as it displayed the style of music that was to manifest into their next studio album. The lyrics of compassion and empathy would later lead into The Dark Side Of The Moon: “Strangers passing in the street by chance two separate glances meet, and I am you and what I see is me.” – this idea is revisited in the tour film for ‘Us And Them‘ with images of commuters walking passed one another, and is an example of the more real and relevant issues that would be at the heart of Waters’ lyrics thereafter. The first half of Meddle, whilst including what was to become a favourite ‘One Of These Days’, is a series of smaller songs that seem only support the mainstay of the album on side two.